(Phys.org) —Living without electricity in today's technological world may be difficult to imagine. Yet the reality of living without computers, mobile phones and entertainment systems, and managing a transport system thrown into chaos by an absence of traffic lights, trains and subways, may become increasingly common, according to a new academic study. New research by Hugh Byrd, Professor of Architecture at the University of Lincoln, UK, and Steve Matthewman, Associate Professor of Sociology at the University of Auckland, New Zealand, reveals that today's occasional blackouts are dress rehearsals for the future, when they will occur with greater frequency and increased severity. According to the study, power cuts will become more regular around the globe as electrical supply becomes increasingly vulnerable and demand for technology continues to grow at an unprecedented rate. Professor Byrd said: "Electricity fuels our existence. It powers water purification, waste, food, transportation and communication systems. Modern social life is impossible to imagine without it, and whereas cities of the past relied on man-power, today we are almost completely reliant on a series of interlocking technical systems. Our research therefore explores what happens when the power goes off, and explains why the security of fuel supply is such a pressing social problem." Electrical power has been defined as a 'critical infrastructure' by the International Risk Governance Council, in that it is a 'large-scale human-built system that supplies continual services central to society's functioning'. However, electricity supply is less robust than commonly supposed. Guaranteed electrical power is under threat because of resource constraint, with the depletion of fossil fuel reserves and the transient nature of renewable energy sources. The Western world also relies on ageing systems, with almost three quarters of American transmission lines more than 25 years old. Professor Matthewman said: "Infrastructural investment across Europe and the USA has been poor, and our power generation systems are more fragile than most people think. The vulnerability of our electricity systems is highlighted by one particular blackout which took place in Italy in 2003, when the whole nation was left without power because of two fallen trees. This reality is particularly alarming when you consider the world's increasing dependency on electricity." While many blackouts occur due to system faults, the researchers reveal that network failure due to inadequate energy is also a growing concern. The study explains that US household electricity usage increased by 1,300% between 1940 and 2001, and looks ahead to the future when demand for electric vehicles and air conditioning systems is expected to rocket. In the last few decades, air conditioning has been the greatest factor in increased electrical consumption and one of the greatest sources of systematic strain, with considerably more blackouts occurring in the summer months than during winter. The electricity used to fuel America's air conditioning is currently a similar volume to its entire energy consumption in the 1950s, and countries such as China and India are following a similar pattern. Professor Byrd added: "Western societies are becoming ever more dependent upon electrical power yet supply will struggle to meet demand, especially if you consider the current rate of population growth and the continuing sophistication and prevalence of electrical appliances. 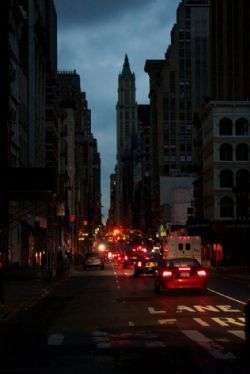 "Research shows that American power outages cause annual losses of up to $180 billion, but economic cost is not the only concern. We should also consider issues of food safety, increased crime rates and transport problems, which are all matters that come to the fore during a blackout. Our research aims to show how important it is to consider these issues, as our increasing demands place additional strains on already struggling systems of generation." More information: The full paper, entitled 'Blackouts: a sociology of electrical power failure', was published by the Social Space Scientific Journal, and can be accessed via the following link. I have solar panels on my house, and I can run grid free forever if I don't exceed 3500 Watts at any one time.